Use the cart to save your favourite items in a list, make a quote or place an order. 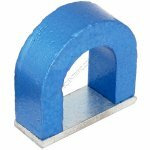 A powerful Australian made horseshoe shaped Alnico magnet. This magnet offers unbeatable value and quality. The distance between the poles is 30mm. Click a curriculum code to see other products that relate. Content © 2003-2019 Scientrific Pty Ltd. All rights reserved. Some content may be copyrighted by ACARA , see here.